I grew up in the North Georgia Mountains and have always loved spending time outdoors camping and hiking. About five and a half years ago, I was diagnosed with aggressive Parkinson’s disease, which attacks the nervous system and organs. Over the last couple of years, my mobility declined to the point that I need a walker or wheelchair to get around. The disease damaged nerves in my feet and legs causing neuropathy, which makes it even more difficult to walk or stand. 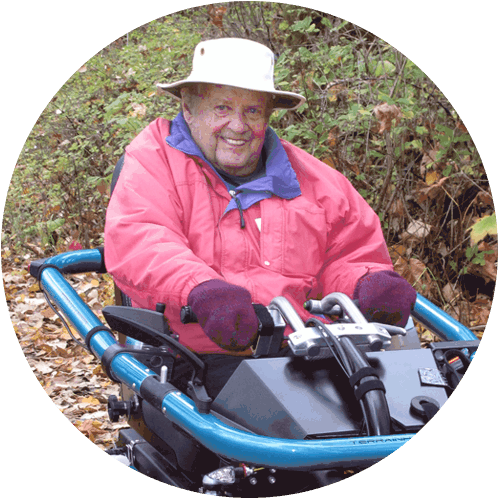 The TerrainHopper gives me more independence and allows me to enjoy the outdoors I love so much. I got “The Beast” in October, and my brother and sisters, wife, and more adventurous friends have enjoyed taking it out on trails all over North Georgia through state parks and on horse trails and hiking trails. I was even able to visit the Indian track rock that is on the border of my family’s land, which was a favorite place to play when I was a boy. It handles every obstacle I’ve encountered—steep trails, slick Georgia red clay, rocks and boulders, and even steps, which are used abundantly on steep Appalachian trails—hence the name, The Beast. I didn’t think I was ever going to be able to get out into the backcountry again, but with my TerrainHopper, I’ve been able to go places my other scooters can’t go. I have been often surprised by but always very pleased with its abilities. My name is Todd Kneale and I was born and raised in Ohio, but after College, I moved to Southern California and began my Career as an Engineer. While I had always loved nature, it did not take me long to discover all there was to see and do in California. I soon became an avid skier, backpacker, and a lover of the outdoors. I could easily escape to the mountains, deserts, or the ocean on any weekend. So much beauty in one place. In 1994, I met my best friend and soul mate (Teresa) at Mardi Gras and we were married 3 years later. What attracted me most to her, besides her loving heart, was her passion for adventure. Shortly after we met, I introduced Teresa to Joshua Tree, where together we learned how to rock climb. We both were very excited about this new sport and for the next 10 years, we spent many weekends climbing, while continuing to ski, backpack and off-road all over California. Our weekends and our vacations were dominated by outdoor adventures, and we loved it as much as we loved each other. Indeed, we have always kept adventure at the forefront of our Marriage. However, unexpected things can happen, which can change our lives forever. In 2003, I was diagnosed with Multiple Sclerosis. As those who have MS and their caregivers know, it can effect each person differently. In my case, this progressive disease that effects the central nervous system has primarily caused the loss of mobility in my legs. As I lost more and more mobility, I slowly lost my ability to rock climb, ski, backpack, and even hike. 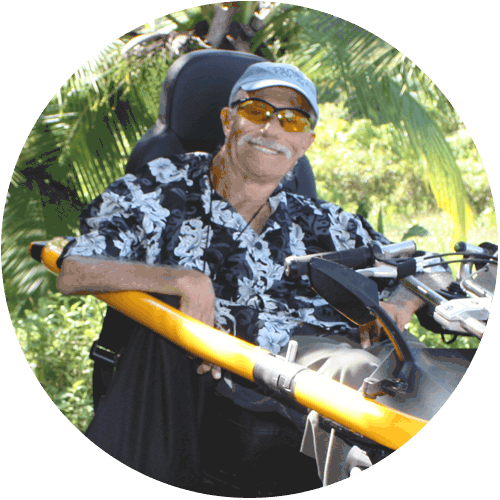 Though life was more challenging, we still always found a way to enjoy the outdoors, but most of our adventures were focused around offroading which still allowed us to get off the beaten path, but I was limited to staying around the vehicle, as no traditional wheelchair was able to navigate rough trails. 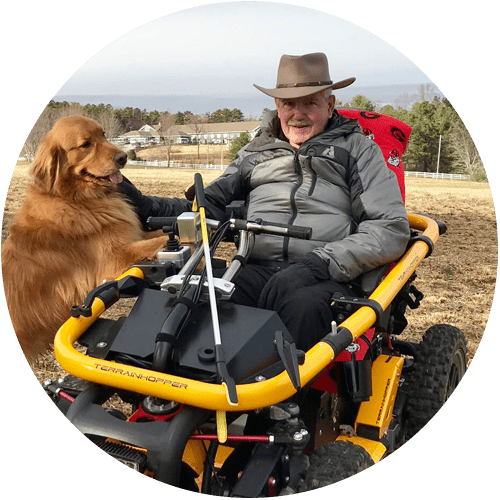 This started a quest, and for years, Teresa and I had been looking for a true offroad wheelchair that could reopen my ability to “move” in nature without a vehicle. Then, thanks to Todd Lemay and TerrainHopper USA, our dreams have come true. To say we were excited, would be a huge understatement, and as it turns out, we were the first to put in a down payment on a TerrainHopper that would be manufactured in the US. We picked up our new TerrainHopper in April of 2018, and it instantly changed our lives. This machine, my 4WD wheelchair, now allows me to “hike” with my wife again. When we venture out into nature, I can leave the truck behind and explore trails, experience vistas, and regain that feeling of really being in nature that had eluded me from a truck. We have had the TerrianHopper on steep and rocky mountain trails, rough desert washes and paths, and ocean sand and surf. I am now able to enjoy and explore the outdoors in a much more intimate way – much more like I used to do. 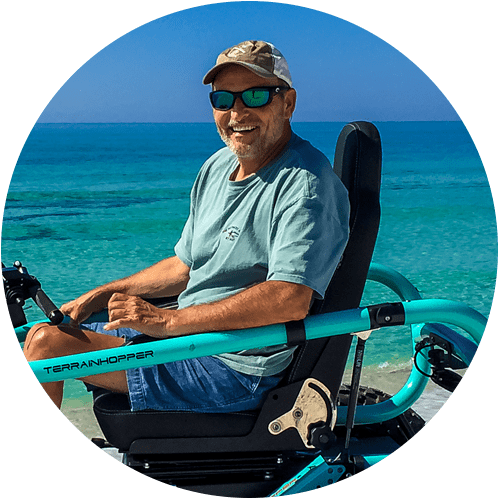 The TerrainHopper has made my world so much larger, and given me the freedom to experience the places Teresa and I love, in a way that I did not think would be possible for me anymore. Thank you Todd Lemay for this gift of freedom. So if there is a single thing that one might take away from my story, I would hope it is this: Don’t let life’s setbacks stop you from your adventures! Having dealt with a progressive disability for most of my life, one of the hardest aspects has been the loss of ability to get outside into places I always loved. As my walking ability gradually disappeared, I relied on an electric scooter but my range was limited by my scooter’s small wheels and low clearance. Wilderness trails were completely beyond my reach. Searching online led me to various manufacturers who claimed their products had off road capabilities, but to them off road wasn’t much more than crossing a lawn. Some European manufacturers flatly refused to sell their off road capable chairs to someone in North America. Then I found out the TerrainHopper was being manufactured in the USA. My wife and I were delighted when my TerrainHopper was delivered. We live in an area with a huge network of forest trails. I was concerned about how cyclists and hikers might react to seeing a TerrainHopper on these trails, so being greeted with enthusiasm and curiosity was a welcome surprise. 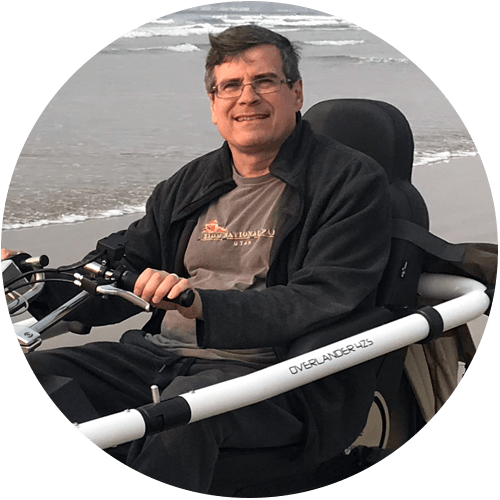 First we tried only the easiest trails as I built confidence and we learned what this remarkable all-terrain chair could handle. Climbing and descending steep slopes was simple. Small obstacles that had turned me back in the past were barely noticeable. Soon we started trying harder trails. The only obstacles we couldn’t overcome were ‘pinch points’ too narrow to pass or very large objects like fallen trees. Getting over curbs and railroad tracks was easy. I can’t overstate the benefits of being able to get outdoors to explore new territory. After years of being tied to home or carefully groomed paths, it’s fantastic to be able to get out and explore. The TerrainHopper has reopened a part of the world I thought was permanently off limits for me. I’d say more but I’d rather be outside. My name is Frank Abbott. I grew up along the Gulf Coast of Florida spending most of my time on, in, or under the crystal clear waters of the Emerald Coast. Between my first and second year of medical school during a routine SCUBA dive, I got “The Bends” sustaining a rare spinal cord injury resulting in incomplete quadriplegia. Needless to say, my beach and water sport activities were subsequently drastically curtailed. After a year in rehab and learning photography, I returned to school. During the ensuing years, in my spare time, I became successful as a landscape and nature photographer. The inability to navigate the soft white sands of the beach I so loved and the inability to get in position to capture a location, just out of reach, had always been tremendous sources of frustration. After retiring from my practice I wanted to devote my new available time to my photography but I needed a way to do it. After a year of Internet research, I found the solution. Terainhopper. My Terrainhopper has exceeded all expectations. After 35 years I regained my freedom. Rediscovering the beach I so loved. Being able to go after shots that use to escape me. And now the ability to take my dog for a run every morning and every night. My regained freedom, priceless. I was paralyzed at the age of 17, gunshot accident, I know it sounds like the opening sentence of what could be a very short story. Or perhaps more likely the beginning of a self help book entitled [hooray for me hooray for you]. But it’s neither of those things, it’s just a statement of fact I was shot when I was 17 years old. That’s an odd time of life, not adult, not child, just raging adolescent sure of everything and knowing nothing. Although I don’t suppose any particular time in life is ideal to be shot. But there you are, statement of fact, and now at the age of 71 simply ancient history. 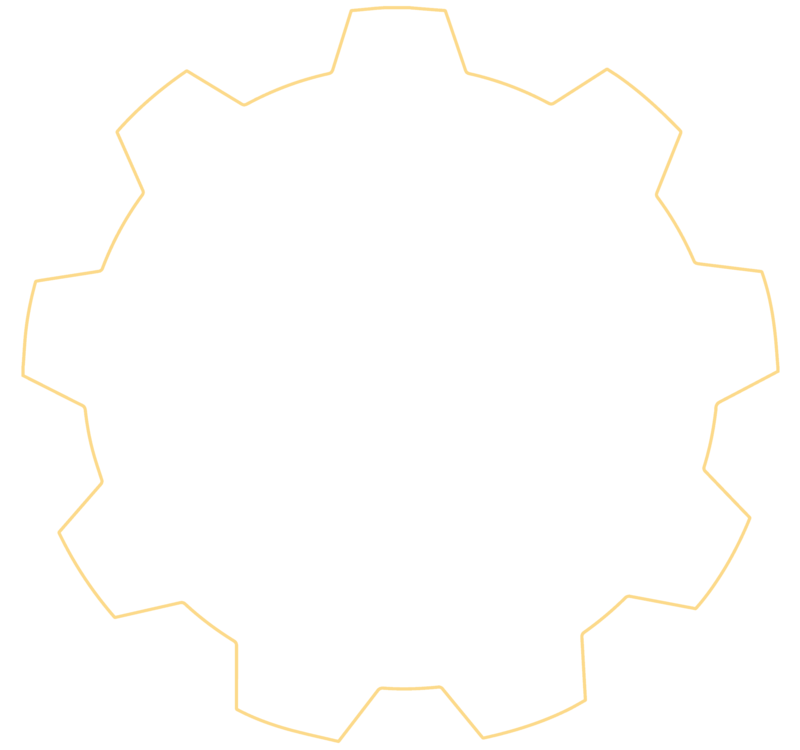 Something that might produce a slight tilt of the head and a wistful smile at the memory. This might be the part where I drag out clichés guaranteed to make me feel better about my life, or to make those who might be in a similar condition feel better about their lives. 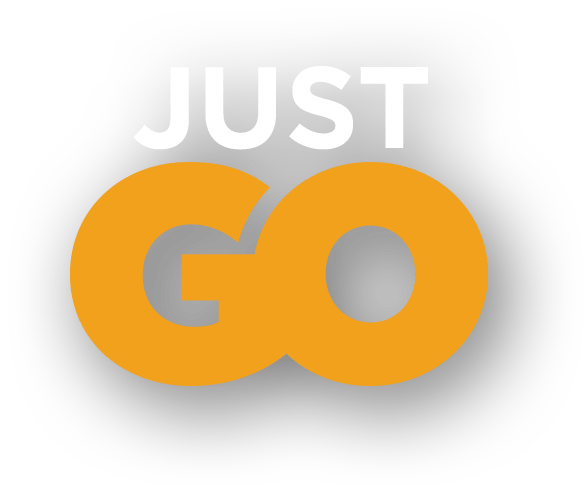 Not going to happen, there is fate, and then there’s responsibility. Fate is what happens, responsibility is what we do about it. And ultimately we are responsible for how we plow through what fate has provided. There’s plenty of poor me, and I can’t, and there are plenty of occasions where architecture or nature gets in the way of what we might want to do. And then there’s opportunity and timing, and finally technology and awareness coming together in, drumroll, okay maybe not a drumroll, but certainly a veritable epiphany for reducing the limitations of the physically impaired in an outdoor environment. I’m a skeptic by nature and in my years I’ve seen lots of attempts for increasing outdoor accessibility, some well-meaning and others with an obvious profit motive. I researched hard and long and after two years opted to fly to Phoenix to meet Todd and test for myself what at the time seemed like the only real option. Well, it may sound self-centered, but I love to be right. It was all right there, the real package, strength, durability, range and comfort, and better yet a manufacturer who knows one size does not fit all. At this point I’m supposed to tell you how the TerrainHopper has changed my life. Does anyone remember their first pair of tennis shoes, rollerskates, long pants. I don’t know something momentous in your life, something that spoke to you so personally words were useless. I’m talking first kiss, I really don’t have the words, whatever was life-changing, that’s the stuff. Okay here’s my story. I live on an island off the coast of Panama. When I got here 12 years ago there were three paved streets and the only ramp in town was into the beer distributor warehouse. Actually that works for me, but as I develop friendships I discovered pretty quickly most everyone lived out of what was laughingly known as town central. What that means is 6 miles up a dirt coral and sand road and two more miles on an overgrown four wheeler trail. These people have monkeys for neighbors and ponds with caiman as landmarks. Real Jurassic Park type stuff and if you’re transportation is not reliable rather than going to dinner you are dinner. All right, that might sound a bit dramatic but since the chair arrived in June it’s taken me to uninhabited beaches unspoiled jungle clearings and most importantly a sense of freedom and independence that I haven’t experienced in over 50 years. I guess that’s it, see you at the beach, or wherever else you got the desire to go. I use my TerrainHopper once or twice a day. I have been everywhere, through mud water above my ankles, soft sand, steep hills, and rocks, including National Parks here in the US. Places I gave up going years ago. I have never gotten stuck. There is no other mobility vehicle like it in the world. Trust me I have looked. The joy of my found freedom with my TerrainHopper is Priceless. "There is no other mobility vehicle like it in the world..."
To say that Isla loves her TerrainHopper Mini is an understatement! It has given her (and our family) a new lease on life. The joy she experiences with her newfound freedom and independence on our property makes my heart swell. She can drive herself up the hill to grandma's house, and play alongside her brother safely and independently. We can now envision family outings to the beach, camping and hiking in a whole new light. The terrain hopper will grow with her, and will positively impact her future. "The joy she experiences with her newfound freedom and independence...makes my heart swell." My son was given a gift that will change his life forever. One that will allow him to navigate the rocky road of life…one that will allow our entire family to explore as a family rather than consistently be a family divided as we found quickly, that mud, sand, streams, water and snow would stop us in a heartbeat and there was no level of creativity that could help us power through it.” Today his unstoppable adventure begins. "My son was given a gift that will change his life forever..."
© 2019 TerrainHopper USA LLC.